Depending on how you look at it, Qualcomm’s $349 Toq smartwatch is either an interesting concept for the future of wrist wearables or it’s an expensive, uncomfortable timepiece with notifications. Actually, it’s both. Disclosure: I approach the smartwatch device class with no small amount of skepticism. I gave up wearing a watch years ago and haven’t missed it. The Android-only Toq almost convinces me to wear one again, but it’s a long way from convincing me to pay $349 for the privilege. The best thing about the Toq is its battery. I’ve averaged five days of battery life on a single charge with moderate to heavy usage. That kind of power management lets you just set it on the included wireless charging stand overnight at the beginning of the week and then put it on and not worry about the battery for at least a few days. Qualcomm has set the bar for smartwatch battery life, and newer entrants to the space need to take note. Unfortunately, the battery is also one of my most disliked features about the watch. 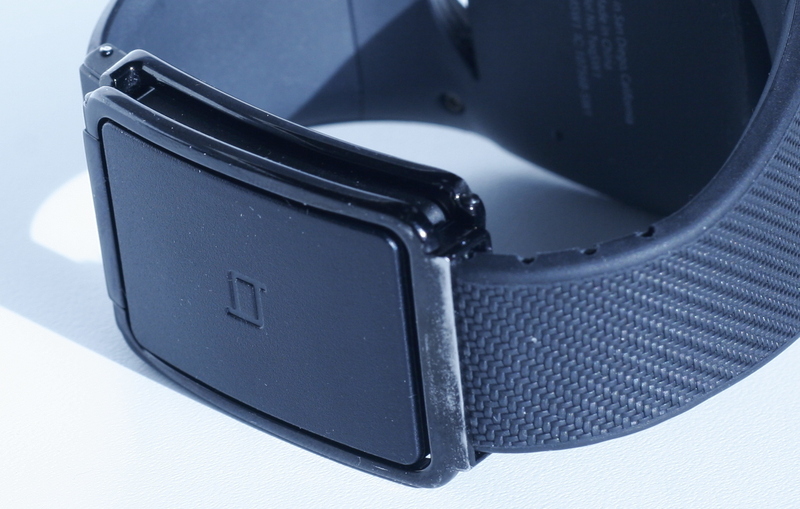 The battery compartment is located at the bottom of the band on the inside of your wrist. Doing so keeps the watchface on top from becoming unwieldy, but the extra width is extremely uncomfortable. When typing on a laptop, the battery elevates the wrist to an unnatural position. Also, the snapping mechanism that fits over the battery and locks the band in place makes an unpleasant scraping noise when typing. In just a couple days of use, the black finish on the watch rubbed away to reveal bare metal. I could take the watch off while I’m at my computer, but doing so defeats much of the purpose of wearing one. If I have to take a watch on and off throughout the day, I’m just going to end up leaving it off. The Toq doesn’t feel particularly comfortable for long-term wear. The arc of the band never fit well around my wrist. In order to begin using the band, you have to cut off part of it to size it and then attach the clasp. That’s an awkward first impression for a product. The notch I chose feels loose, but I have no way of telling whether the next size down would fit me better without having to snip off part of the band. The whole process needs to be rethought. I do love Qualcomm’s Mirasol color display. It looks gorgeous and works great whether you’re inside or outside. A simple tap on the top of the wristband activates the backlighting. The Toq’s buttonless design is nice, too. Tapping the wristband on the other side of the face calls up the menu. From there you can tap or swipe to navigate. When the watchface is displayed, you can swipe across it to change styles. In terms of functionality, the watch’s main appeal lies in beaming in notifications from your Android phone. You can manage which notifications you receive from the Toq app. The text on Gmail notifications tended to get cut off, but other apps were able to send their alerts without trouble. Beyond notifications, Qualcomm offers a few on-board applets for the Toq, such as Calendar, Weather, Music Player, Stocks and a Comms Hub. The Music Player works decently as a remote for control playback on your phone and the Comms Hub’s configurable quick reply text messages could come in handy, but, in general, the applets’ features are of questionable value to me. The day traders among you might find it useful to check stock prices on your wrist, but that has got to be a very small minority. If you think of it as a concept or a prototype, the Toq is mostly a success. It’s got great battery life, a beautiful display, a painless charging system and enough functionality to prove its point. As a consumer product, it’s just short of a disaster: uncomfortable to wear, overpriced for its features and clumsy design.